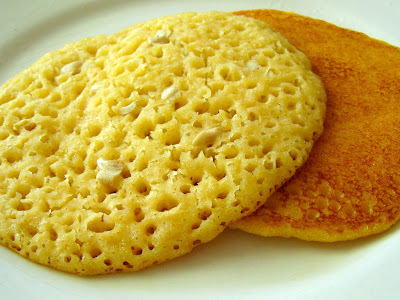 Surnoli: Surnoli is a kind of Pancake popular among the Konkani community. They have a puffy texture with holes, with a yellow color and are usually made about 10 inches in diameter. Surnolis are traditionally eaten for breakfast or afternoon tea, served with homemade butter. Surnoli batter is made by grinding together soaked rice mixed with poha, coconut, buttermilk, jaggery and turmeric into a smooth paste. The batter is cooked covered on a girdle on one side. Soak rice with yogurt in a bowl for 4-5 hours. Add in the pressed rice and 1/4 cup coconut. Keep aside, for half an hour. Grind the mixture into a coarse paste. Add in the shredded jaggery to the batter. Cover with a cotton cloth and set aside to ferment overnight. Heat the oil (about 2 tbsp) in a non-stick pan, on medium heat. Add in the chopped onion, ginger and green chillies. Sauté for about 2 minutes. Heat a non stick tawa on medium heat. Grease the tawa with a little oil. Add in the salt to the fermented batter. Pour a ladleful of the batter on the hot tawa. Spread the batter to make around a pancake of about 10 inch diameter. Immediately sprinkle the onion mixture. Sprinkle some oil and press lightly. Cover and cook till the underside turns golden. Surnoli is ready to be served. If you have any queries regarding the Surnoli recipe, please leave a comment.